This week Mgr Basil Loftus attacks pretty well everyone. Consequently the editor of The Catholic Times is so pleased with him that not only has he included Loftus in the banner headline on the top of the front page (notice the MGR in capitals), but he has dug up a short letter praising Loftus from the mailbag. Whoever has that job, of shredding the cart-loads of letters critical of the great Mgr and fishing out the occasional one in his favour, isn't paid enough. 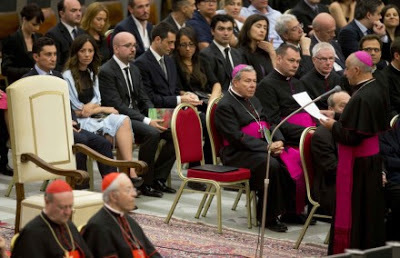 ...he would rightly have been appalled when he saw the huge white throne, surrounded by slightly lesser scarlet ones for cardinals, with second and third-class seating-arrangments provided for those who wore only purple or black. Then, of course, the laity were 'in the gods'. Certainly they were nearer to God than some of the vain-arrogant people in the 'stalls'. The bitterness is incredible. What does Loftus know of the inner dispositions of the clerics at the concert? Anyway, it is all a fantasy. The photograph above these words, which is identical to the photo I have uploaded, clearly shows that, apart from the Pope's chair (only a 'throne' by association with its intended occupant: I've seen grander chairs at the dentist's), all the other seats were alike, and the laity were occupying the very next row behind it. They could have touched the Holy Father by standing up and taking one step forward. Had he been there, that is. Not that it is for me to defend the personal holiness of Curial monsignori. They are probably a mixed bunch, like the rest of us. Equally it's not my brief to defend the various orders of knights which Loftus attacks this week, singling out the Order of St Lazarus, which he claims has been 'outlawed' (see such a defence here, I confess my ignorance of the minutiae). I think he has confused the clarification of the status of such groups (in October last year) with the question of their legitimacy as an association of the Faithful. The idea that the laity aren't allowed to group together, and have their groups recognised by the Church, is just bizarre. He doesn't seem to make any distinctions when he writes, of groups of any kind, that 'together, dressed up in church, they are an obstacle on the pilgrim-path to the one Kingdom to which we all aspire, where there will be no titles, no diviseness [rules you out, then, eh Basil? ], definitely no fancy dress, and where only the angels will have plumes to preen. 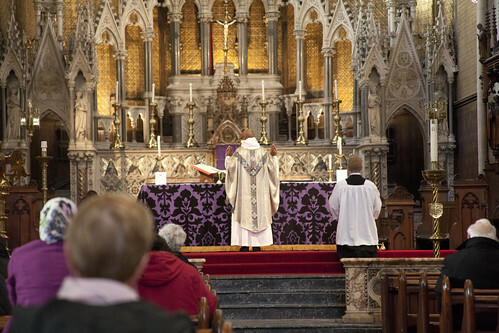 Another unclamorous Low Mass: the Dominican Rite in St Dominic's, Haverstock Hill. One server, no pack-drill. Along the way he is betrayed into the absurd claim that everyone will be equal in heaven. Do you mean that, Mgr? Our Lady equal to those saved 'as a brand from the fire' (Zachariah 3.2)? We have St Paul's teaching on this: 'star differs from star in brightness' (1 Corinthians 15:41). 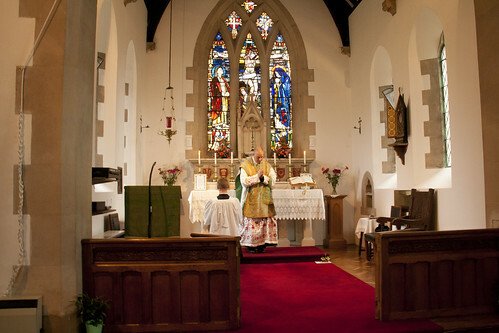 Mass as simple as they come: Low Mass at St Dominic's Nymphsfield, celebrated by Fr Alexander Redman. What we have to challenge today is the 'clamour' in church. Not the noise, which is a life-sign of the Church, but the pomp, which is the very antithesis of the People of God. 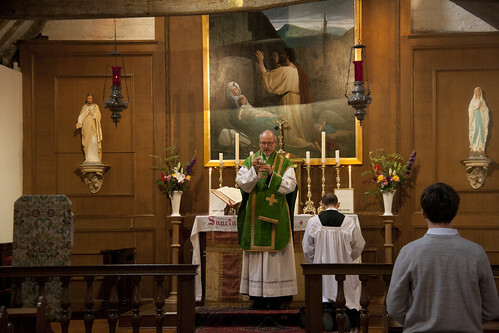 [Pope Francis does not] have any room for 'liturgica clamorosa' - or pompous liturgy. As he stamps that out by the instruction of his own example, we surely then need to move on to a further consideration. 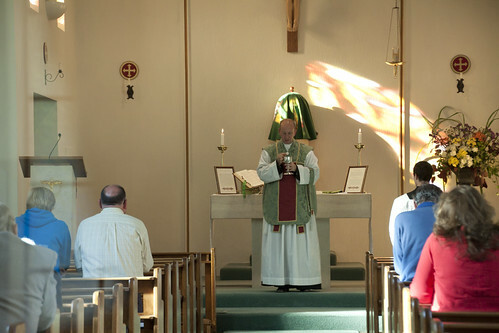 How can we tolerate, let alone encourage, alternative and extraordinary forms of worship within the parameters of the Catholic Church, whether in the extraordinary form of Mass or in personal ordinariates, where the 'clamour' or pomp now rightfully being expunged from the Church lingers on? At the moment this is only a question. It may well soon become a real problem. If Loftus was not such a pathetic has-been, that last sentence would sound menacing. As it is, it reminds me of a story, from the Life of St Basil in the Golden Legend. Another hermit saw St Basil, how he went in the habit of a bishop and deemed evilly in his thought, how he delighted in this estate in vain glory, and anon there came a voice that said to him: Thou delightest thee more in playing with and handling thy cat, than Basil doth in all his array and adornments. St Basil wore the splendid vestments of a bishop, and the hermit thought himself terribly superior: clearly this was a man of vain glory! Not like him - oh no. But actually the hermit was a more sensuous man than St Basil, even if he sensuality was expressed only in the delight he took in stroking his cat. 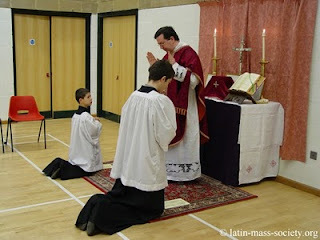 So you still think the Traditional Mass is always elaborate and 'pompous'? Here is Low Mass in a basketball court - because there was nowhere else to have it, in Oxford, back in 2004. Celebrated by Fr Andrew Southwell, with the permission of the then Archbishop of Birmingham, Vincent Nichols. Instead of attributing faults to others, we should examine ourselves. Basil Loftus, he of the 'MGR' in capitals on the top of the front page of a national Catholic weekly, could learn a lesson from the life of his illustrious namesake. "Whoever has that job, of shredding the cart-loads of letters critical of the great Mgr and fishing out the occasional one in his favour, isn't paid enough"
To be realistic - there is not much else to do for entertainment in Cheadle Hulme, except stand behind the vents at Berger's High Class Dry Cleaners and try to get high on the fumes. "How can we tolerate, let alone encourage, alternative and extraordinary forms of worship within the parameters of the Catholic Church, whether in the extraordinary form of Mass or in personal ordinariates, where the 'clamour' or pomp now rightfully being expunged from the Church lingers on?" I appreciate Msgr. Loftus' candor: At least he freely admits that he is, in fact, "intolerant." There's no room at all for certain people, or certain kinds of worship, in his Church.